The soldiers were assigned to 1st Battalion (Airborne), 508th Infantry Regiment, 173rd Infantry Brigade, Camp Ederle, Italy. In the days before his death, Private First Class John D. Hart called his father to tell him how unsafe he felt riding around Iraq in a Humvee that lacked bulletproof shielding or even metal doors. It would be the last conversation Brian T. Hart would have with his 20-year-old son. On October 18, 2004, near Kirkuk, Saddam Hussein loyalists ambushed his son's Army convoy, killing two. A hail of bullets felled the Bedford High School graduate while he fought from his Humvee. "When he died, all his ammunition had been spent," the unit commander wrote in a letter to Hart's parents. "Your son gave everything he had for the safety of others. . . . As a commander, I struggle to find words that adequately capture the depth to which we honor Private First Class Hart." For Brian Hart, a 44-year-old Bedford businessman, his only son's last words have come to haunt him, especially after learning that other families who lost loved ones in Humvee attacks had complained to the Pentagon about the lack of armor in vehicles. In fact, an average sport utility vehicle found on US roads provides more protection than Hart's Humvee. "He would have been better off in a Toyota Highlander," the father said. Turning grief into action, Hart cobbled together a loose network of soldiers, their relatives, politicians, and defense contractors to pressure the military to beef up its Humvees. Since his son's death, Hart has seen results: Since January, the Marine Corps has ordered $9 million worth of bulletproof Humvee door panels from Foster-Miller Inc. of Waltham, and last week the Army said it would double its order of heavily armored Humvees from its contractor. More Humvees in Iraq still need extra protection, but Hart's headway is remarkable for how quickly he has navigated the byzantine military-procurement system. Senator Edward M. Kennedy, Democrat of Massachusetts, whom Hart enlisted in his cause, believes the father's success can come only from a parent who "feels a desperate sense of loss that he doesn't want it to happen to another parent." Most versions of the military transport known as the Humvee, short for High-Mobility Multipurpose Wheeled Vehicle, use body panels made from thin aluminum or fiberglass. That reduces weight but stops few bullets. Military planners thought tanks or armored personnel carriers would be used for combat patrols. But there are not enough to go around in Iraq, where American troops drive more than 10,000 Humvees, according to the Army. Last spring, the Army sent more than 500 "up-armored" Humvees made by Armor Holdings Inc.'s O'Gara-Hess & Eisenhardt unit in Fairfield, Ohio. These vehicles add about 3,800 pounds of bulletproof windshields and steel plating to the 6,000-pound Humvee made by AM General LLC of South Bend, Indiana. Other Humvees are reinforced with lighter, add-on steel armor kits. The protection became more valuable last summer, as the guerrilla warfare began. Patrols faced more attacks and land mines, making reinforced vehicles critical. How they would get more, quickly, was unclear, since the Pentagon's original 2005 budget request included 818 up-armored Humvees. An unarmored Humvee costs about $75,000, while an armored one costs about twice as much. Of the total number of Humvees in Iraq, just over 2,000 are fully armored, according to an Army tally, about half of what it says it needs. Designers at Foster-Miller, a closely held engineering company, proposed a quick fix: use armor panels made from ceramic and Kevlar that could be attached to Humvee doors with Velcro. The idea is less unusual than it sounds. Since the early 1990s, the company has used fabric strips made or designed by Velcro USA Inc. of Manchester, N.H., to attach similar panels inside the cockpits of military transport planes. While the Army tested Foster-Miller's product last fall, the service still has not ordered any. Other companies that proposed similar add-on armor kits complained Army officials were not interested. The Army acknowledges it has been slow to fortify its Humvees, but says it is moving as fast as it can. Acting Secretary of the Army Les Brownlee told a Senate Armed Services Committee last week that when US troops first arrived in Iraq last spring, "there wasn't a feeling that all Humvees should be up-armored," partly because the extra weight slowed them. By June, the Army saw that its Humvees needed more protection from the flood of land mines. "We realize that all soldiers were being exposed to these kinds of attacks and that convoys, in particular, were exposed," Brownlee said. "That's when we began to ramp up to provide those as soon as we could." The effort was not fast enough to save John Hart. As a teenager, the strapping Hart knew he wanted to be in the Army and prepared himself by joining Bedford High's rifle team and Junior ROTC program. Even his teenage mischief had a military bent. Longtime friend Ben Chambers recalled sneaking out of their houses at 2 a.m. to plaster Army stickers around town. Hart's mother, Alma, sent his name to a Navy recruiter, thinking that service might be safer. But Chambers said Hart was determined to wind up as an Army soldier "on the ground actually doing something as opposed to sitting behind a desk. He wanted to be the person making a difference." After enlisting in September 2002, Hart joined his unit, the 173d Airborne Brigade, in northern Iraq last summer. A trained paratrooper, he was in several firefights and earned a Combat Infantryman Badge. Others in his unit have since told his father how they also felt vulnerable on patrol in Humvees. One was Specialist Joshua Sams, the driver of Hart's Humvee who was injured during the ambush. In a telephone interview, Sams said he was not sure whether armor would have saved Hart, because he was riding in the open bed of the Humvee when the squad came under fire. Sams said armor would have protected another soldier, Lieutenant David R. Bernstein, 24, who died in the attack. A graduate of the US Military Academy at West Point, N.Y., Bernstein bled to death after being hit by a bullet that tore through the Humvee, Sams said. "You could see the hole" in the vehicle, Sams said. On Oct. 19, Brian and Alma Hart woke to a 6 a.m. knock at the door at the family's Bedford home. A policeman, a local priest, and an Army officer delivered the news. At the time, the family was scheduled to move to Illinois, where Brian Hart was to start a new job as an executive at a drug wholesaler. The family remained in Massachusetts, fearing a move would be too stressful, and Hart began a local job search. He has devoted much of his time to researching armored vehicles. Working the Internet and phones daily, Hart learned about more soldiers killed in unarmored Humvees and which defense contractors made add-on armor for the vehicles. He also became an outspoken critic, appearing on national radio shows, granting newspaper interviews, and making trips to meet with politicians in Washington, D.C.
After his son was buried at Arlington National Cemetery, Hart took up the issue with Kennedy, who attended the service. Kennedy said he had heard concerns about Humvees, but embraced the issue after meeting with the Harts. Of the 18 soldiers killed in Iraq who were either Massachusetts residents or who have next of kin in the state, six died in unarmored Humvees or trucks, according to a count by Kennedy's office as of mid-January. Hart touched base with others in Washington, including Democratic Representatives John Murtha of Pennsylvania and Brian Baird of Washington. Other politicians got involved after hearing concerns from their constituents. They, in turn, began to contact Army officials about the Humvee armor and why more units did not have it. At a Senate hearing in November, Brownlee, the acting secretary of the Army, said the service had ordered as many up-armored vehicles as its contractors could produce, but that it would take until mid-2005 to deliver them. That seemed like a long time to Hart. He went to the Web and learned that the armor makers were not at full production. Later, a representative from O'Gara-Hess confirmed that. Hart took those details to Kennedy's office. Armed with that information, the senator urged the Army to speed its approval and acquisition process. Under pressure, the Army tested bulletproof door panels from Foster-Miller, the Waltham defense contractor, making them ready for the Marine Corps to buy in January. "The political questions raised the profile of the issue," said Doug Thomson, business development manager at Foster-Miller. A major breakthrough came last week, when Brownlee unveiled plans to double orders of heavily armored Humvees, from 220 to 450 a month. While a good start, Brian Hart said, he hardly calls it a victory. He still plans to spend much of his time working the phones to make sure the plans get fully funded. "It's an obligation," Hart said. "Pretty much an obligation from a father to his son to try to protect his friends." Brian Hart is on a quest for answers. By night, he sends e-mail messages and posts notes on electronic bulletin boards. By day, he works the phones. Mr. Hart is haunted by the ambush that killed his son. 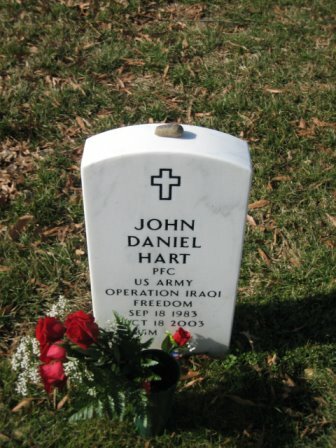 Private First Class John Hart, a 20-year-old paratrooper with the 173rd Infantry Brigade, was hit in the neck and killed on October 18, 2003, in Taza, near Kirkuk. It was the same late-night attack that took the life of Lieutenant Bernstein. Their unit was ordered to find the enemy. The enemy found them. But what happened after that, after the grenades ripped into the Humvee? "Did John bleed to death? Did he suffer?" asked Alma Hart, his mother. Mr. Hart is more critical. "The Army hasn't given us any more information than a three-sentence press release," he said. "It's awful." An Army spokeswoman, Shari Lawrence, said what relatives are told about a soldier's death was sometimes incomplete "because we try to notify the family as quickly as possible." So the Harts have turned to their son's comrades for information. They have learned that some soldiers have been camping out in water treatment facilities and sleeping on pipes. And that others lack the right protective gear. And that most Humvees, like the one their son was riding in, are not armored. "It breaks your heart that these kids are living in real deprivation out there and we don't know about it," Mrs. Hart said. Major Gary Tallman, an Army spokesman, said that nearly 50,000 troops in Iraq, more than a third of the total force there, did not have bulletproof vests, but that the Army hoped to have them outfitted by next year. The Harts are working with members of Congress to get more resources now. They still support the war. They just want it fought better. When Army Captain John R. Teal was in high school in Hanover County, Virginia, he told his mother that he didn't like how the school would "just throw the flag" up the pole in the morning and pull it down at night. So he persuaded school officials to institute a military flag ceremony, which he helped conduct daily until his graduation in 1990. A decade later and more than 500 miles away, John D. Hart joined Junior ROTC at his high school in Bedford, Massachusetts. After he watched the events of September 11, 2001, on television, Hart decided to dedicate himself to what had been an occasional dream -- becoming a soldier. He enlisted in the Army shortly after graduation last year and wound up a Private with the 173rd Airborne Brigade. Yesterday, Teal and Hart became the 32nd and 33rd U.S. casualties from Iraq to be buried at Arlington National Cemetery this year. Before Teal's ceremony, a bittersweet irony was on the mind of his mother, who recalled that it was a former guard at Arlington who had taught her son how to care for the flag in high school. "So it's going to take everything I've got to keep it together when they hand me that flag," said Emmie Teal. "It's going to be rough." John Teal, 31, was killed October 23, 2003, when a homemade bomb exploded on a roadside where he was traveling with a convoy about 30 miles northeast of Baghdad, according to the Army. Family and friends remembered him yesterday as someone who made fast friends with almost everyone he met. They recalled him playing soldier as a boy of about 10, dressed in fatigues and patrolling the ditches around the family's central Virginia home. Emmie Teal said that when her son was deployed to Iraq, she had a dark feeling that something bad could happen. That tension stayed with her every day, she said, until the uniformed officers showed up at the door to break the news to her and her husband, Joseph. "Part of me didn't believe it when they told me," she said. "I had to see him, just to make sure there wasn't some mistake. I knew they weren't wrong, but I had to see for myself." After Teal's body was shipped home to a funeral parlor just outside Richmond, the bad news sunk in with finality. By the time Emmie Teal greeted the other teary-eyed mourners at the graveside service yesterday, she had been allowed a few private moments for one last look at her son. "But what we saw there, that wasn't the boy we knew," she said. "The smile was gone. He was never without a smile." A few hundred yards from where a composed Emmie Teal was handed the folded American flag that had rested on her son's coffin, Hart's graveside ceremony was soon to begin. 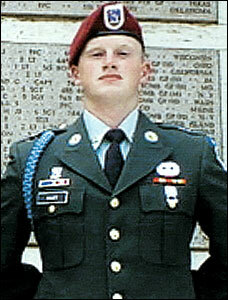 Hart was killed five days before Teal, when his Humvee was ambushed near Kirkuk in northern Iraq. A memorial service for Hart last week drew hundreds to the Bedford town common for a candlelight vigil. At that service and at yesterday's burial, friends remembered the 20-year-old soldier as playful, determined and kind. They described a young man who loved animals and -- before settling on a career in the military -- talked of being a veterinarian. "He placed others' well-being above his own," said the Rev. John Gibbons, of the Bedford Unitarian Community, who delivered a graveside eulogy. "He was proud to serve in freedom's cause." The soldier's parents, Brian and Alma, were joined yesterday by Hart's two teenage sisters and a large contingent of family and friends who traveled to Washington from Massachusetts. Ed Hynes, a family friend, said that the conditions described by Hart in letters home have led the family to make appeals to the military to provide more resources to protect service members in Iraq. "The message they want to get out from all this is to make sure the soldiers are properly equipped over there -- they're not 100 percent sure that's the case," Hynes said. "And they also want to make sure the American people welcome home each and every soldier with open arms, whether they agree with this war or not." BEDFORD, Massachusetts - Tears and laughter marked the memorial service for Army Private John Hart, as family and friends remembered a kind and ever-smiling young man who loved animals and dreamed of serving his country. ''You dreamed of being a soldier and you lived your dream,'' an emotional Brian Hart told his son at the interfaith memorial service at St. Michael's Church in Hart's hometown. Hart, who enlisted right after high school, was killed last weekend when his patrol came under fire in Iraq, exactly a month after he turned 20. ''I presumed you'd come back and become a teacher or a counselor. You already were a counselor to many,'' Brian Hart said. Hart recalled how the September 11 terrorist attacks changed his family and strengthened his son's resolve to serve his country. He and others remembered the young man who loved animals so much that he once brought a wounded skunk home and had to get rabies shots. Another time, the adventurous Hart and his buddies got so lost on a camping trip, it took them nine hours to get to Mount Monadnock in New Hampshire usually about an hour's drive from Bedford. ''They managed to miss the entire state of New Hampshire,'' said Major Dennis Saucier, a chaplain in the Air Force who was also a neighbor of the Harts and whose son was also on that trip. Laughter rippled through the church. That trip also brought out Hart's compassionate side. Hart found a woman stuck on the mountain with a broken leg, and he and his friends ran up and down the trail to get help and care for her, Saucier said. After the service, bagpipers played in the light drizzle and a veterans' color guard marched to a plaza behind the church, where junior ROTC members from Bedford High School folded a flag and presented it to Hart's parents. More than 400 people, including Governor Mitt Romney and his wife Ann, attended the ceremony. Hart, whose body was still in Germany, will be buried in the Arlington National Cemetery in Virginia on November 4, 2003. NewsCenter 5's Jack Harper reported that Private First Class John Hart, a member of the 4th Infantry Division, was part of a patrol that came under attack from rocket propelled grenades and small-arms fire Saturday outside Kirkuk. For much of his life, Hart wanted to be a soldier and enlisted when he turned 19. "When I heard what had happened, it was like somebody just tore the heart out of my chest. John is just such a good kid. When he would walk into a room, it would just brighten everything up. He always had a smile," ROTC instructor Rich Carson said. Hart graduated from Bedford High School in 2002. "He really, really wanted to be in the Army. He really wanted to serve his country. He had such a strong desire, ever since he was little, to go into the service and be here," classmate Adam Lauriere said. On Saturday afternoon, one month after he turned 20, Hart was killed in the ambush. "He is a young man who tried to do the right thing. He wasn't afraid to face evil where he saw it. He said that he thought that at least 90 percent of the people in his region were supportive of them. There were 10 percent that were out to kill him," Hart's father, Brian, said. "He had a very big heart. He was always a gentle person. He worked very hard. He always wanted to be a soldier, and he would been a very fine man," Hart's mother, Alma, said. "We are very proud of him." The family said that funeral arrangements are not complete, but that Hart would be buried in Arlington National Cemetery. One hundred four Americans have been killed by hostile fire in Iraq since President George W. Bush declared an end to major combat operations on May 1. Army Private First Class John Hart, 20, was killed in ambush Saturday night in Iraq. He is the son of Brian and Alma Hart of Bedford. Hart grew up in Bedford and attended Bedford High School where he played lacrosse and was a member of the rifle team and Jr. ROTC. "He liked to be with a big group of friends, and the group liked him," said his 16 year-old sister, Rebecca. Hart's other sister, Elizabeth, is 13. "He was a good big brother." Hart's father, Brian, said they talked to him just last week, and he sounded concerned about recent activity in his area. He felt their Humvees needed more armor, for example. Also, their living conditions were not good. Brian Hart said his son didn't have the right body armor, and the soldiers were given winter desert fatigues because the Army didn't have enough summer fatigues. Hart's patrol, part of the Fourth Infantry Division, was hit with rocket-propelled grenades and small-arms fire in a town called Taza, near the northern city of Kirkuk. "He had been in combat at least three times since he'd been there," Hart's father said. "He went into harm's way knowing the consequences." Hart's lieutenant was killed with him in the string of attacks that night. Hart's mother said being in the Army suited Hart's personality. "He was always a leader," she said. "I tried to talk him out of it. I think he genuinely wanted to serve his country." Hart turned 20 on September 18, 2003, the exact day he enlisted one year ago. He had been in Iraq for only a few months. "John was always one of those outgoing children," Hart's mother said. "When he was little and we went out, I made him wear a red shirt so we could spot him -- he would want to run off, play with other kids." Adam Lauziere, 19, was a friend and classmate of Hart. They were in Jr. ROTC together since their sophomore year. "It made him happy," he said. "The only thing he ever talked about was being a ranger." Rebecca said her brother was a very caring person. Once, she said, he rescued a limping skunk from the side of the road. As a result, he and his friends had to get rabies shots. Neighbor Doug Townsend, who has been helping the Harts since Sunday, said his daughter rode the school bus with Hart. He was a good friend, he said -- like a brother to his daughter. Last spring, soon after John was deployed, Brian Hart publicly declared his disdain for the "Speak Out for Peace" sign that was put up on the First Parish Church by parishioners. He claimed the sign disrespected those who are fighting for our country by suggesting that peace is the answer to the problem. He saw the sign on his way to pick up his son from the airport in March, the last time he came home. The Rev. John Gibbons said the church did not mean disrespect for those serving; they simply wanted to uphold the idea of peace. The church agreed, however, to take the sign down after two weeks. Now, the Harts are friends with Gibbons, as the reverend shows them support during this hard time. The Harts held a press conference yesterday afternoon at their home. Friends and neighbors dropped by all day, and the phone was active. One family friend dropped by after shopping for some food for the Harts; she said Stop & Shop had heard what happened, and the store donated food to the family. Hart was part of the 173rd Airborne Brigade. His father believes his son's patrol helped prevent a civil war in Iraq. Hart's parents said the Army also increased Hart's confidence, that it was good for him. "I cried when he left," Hart's mother said. "He called me the next morning and said, 'I'm sorry I made you cry.'" Maj. Dennis Saucier is the Base Chaplain at Hanscom Air Force Base, and Hart's father said he was a friend of his son. Through Saucier, Brian Hart was able to learn that John's body is in Germany right now. 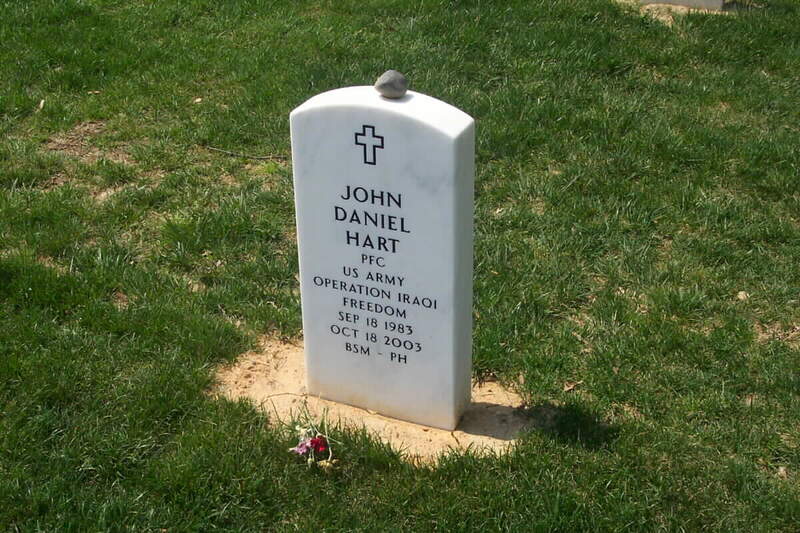 Hart is eligible to be buried in Arlington National Cemetery, and that is where his family decided he should rest. Preparations for the funeral will be made in the next few weeks. Last weekend, the Harts sold their house and will move to the Chicago area. The Harts want to donate a bench or other memorial to their son and place it near the high school. Hart was one of the students in the Jr. ROTC who took part in the honor guard at the unveiling of Memorial Park in Bedford. Brian Hart's opinion of the war has not changed since his son's death. "It is cruel fate that someone so good and so loved would perish, and truly evil people continue to perpetuate fear and destruction," he said. "There may be a smarter plan than this, but I don't know what it is." There may be a local memorial service for Hart this weekend, but there are no details yet. His friends are planning a candlelight vigil in Bedford this week. 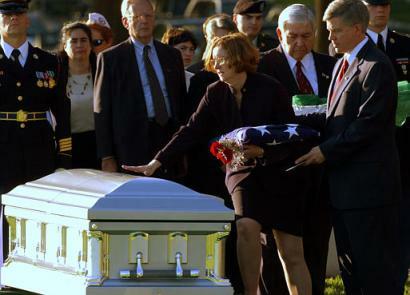 Army Private First Class John D. Hart, at Arlington Cemetery, Tuesday, Nov. 4, 2003.
when enemy forces ambushed his patrol using rocket propelled grenades and small arms fire. Hart's sisters Rebecca 16, second from right, and Elizabeth, 13, right, also attended the funeral. 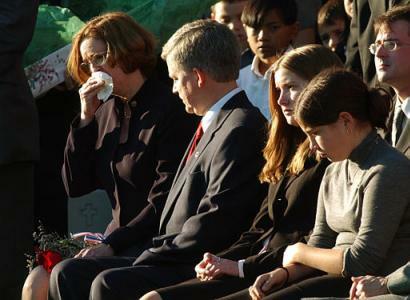 Alma Hart stood over her only son’s grave at Arlington National Cemetery in November 2003, vowing to honor his life. Pfc. John Hart was just 20 when he was shot dead by an Iraqi enemy – just three months after his arrival in Iraq. Today, as another Veterans Day passes, Alma Hart, 47, her husband, Brian, 46, and their two teenage daughters will lay a wreath in John’s memory at Memorial Park near their Bedford home. John Hart was one of 31 Massachusetts soldiers killed in the war so far. But helping the living is what helps his mother make sense of her child’s death. She has begun volunteering at Bedford’s Veterans Administration hospital, determined to make sure the soldiers there aren’t ignored like many who returned from Vietnam. 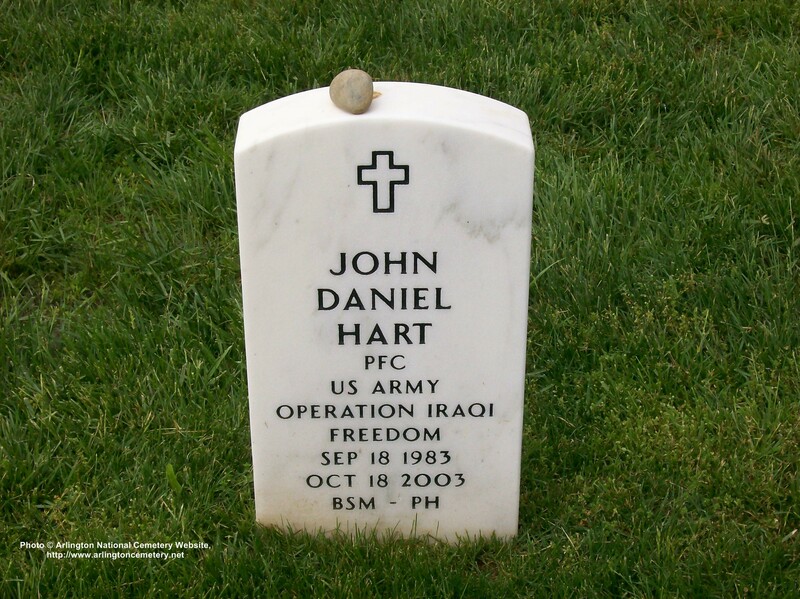 John Hart was killed as he traveled with fellow soldiers in a canvas-covered Humvee in Northern Iraq. In a phone call home a week before his death, he told his father he lacked body armor and ammunition. “He said, ‘Dad can you do something?’ ” Hart remembered. Alma Hart said she and her husband were stunned, though they had heard news reports of ill-equipped soldiers. “We were hoping it wasn’t true. President Bush had announced the war was over in May and I thought they were just there on peacekeeping stuff,” Hart said. By the time the couple decided to write a letter to Massachusetts congressmen, “the Army was ringing the doorbell to say John was killed,” Hart said. “They sent him into an ambush where there wasn’t a snowball’s chance in hell he was going to survive,” she said. She vividly remembers the early morning in October 2003 when her doorbell rang. Looking out the window she saw a local police officer, a priest and an Army official. “I thought: ‘I just won’t open the door. They can’t tell me if I don’t open the door,’ ” Hart said. Hart feels deceived the White House hasn’t established that Iraq had weapons of mass destruction or a connection to al-Qaeda. “I bought the whole line. The president told me something and I believed him,” Hart said. “But Brian and I have this nagging fear that it is going to come to nothing. We want something meaningful to come out of this for John. This is the big tragedy for us, and to think he was lied to by his government and sent over there ill-equipped and unprepared is very upsetting." She wants American troops brought home. The world's most powerful military failed to provide the armor that would have saved scores of American lives. One father wouldlike to know why. Private First Class John Hart whispered into the phone so he wouldn't be overheard. It was just a matter of time, he said, before his buddies and he bumped down some back road in Iraq right into an ambush. They were so exposed, the somber young soldier told his dad, back home in Bedford, Massachusetts. They were riding around in unarmored Humvees with canvas tops and gaping openings on the sides where doors should be. That seemed pretty stupid now that people were shooting at them and lobbing rockets. John, a 20-year-old gunner whose job it was to keep his head up and return fire, felt hung out in the breeze. The convoy rolled away from the safe house into the dark. There were 14 men among the three vehicles. Kilbride, one of at least four members of his extended family to graduate from West Point, rode in the lead Humvee. His second in command, 1st Lt. David Bernstein, 24, was in the last Humvee with Williams and Hart. Specialist Joshua Sams, 20, was at the wheel. Bernstein was valedictorian of his suburban Philadelphia high school. He graduated fifth in his class at West Point. He was so fit and gung-ho about physical training that his men affectionately called him Super Dave behind his back. Everyone liked Super Dave. He was known for listening to the concerns of his men and trying to help. "I respected him not because he was an officer but because of who he was as a person," Sams says. Senator Edward Kennedy (D-Mass.) was planning to attend John's November 4 funeral. Brian contacted his office and asked if he and Kennedy could meet before the service to talk. Some of Brian's relatives were aghast. Brian grew up in a family of fundamentalist Christians who vote Republican. At the University of Texas, Brian was president of the campus Republicans. Now some of his Texas relatives warned Brian not to be seen with Kennedy, he recalls. Brian didn't care. To get answers, he needed allies. He even called John Kerry's presidential campaign; but nobody called back, he says. Kerry did send an aide to John's funeral. WE HAVE WHAT WE HAVE," Army Chief of Staff Peter Schoomaker said as he sat at the witness table in a meeting room of the Hart Senate Office Building. "We have as much body armor as we have, because that's what we invested in. We have the amount of Humvees because that's what we invested in." "There is no rear area," Senator John Warner (R-Va.), the committee chairman, said. ON THE EVE OF WAR -- eight months before Private First Class John Hart and First Lieutenant David Bernstein took their final ride in an ill-equipped convoy -- some of the nation's most powerful members of Congress asked top military and defense officials to testify about Bush's defense budget. The hearing room was packed on February 13, 2003, as General Richard Myers, the chairman of the Joint Chiefs of Staff, and Secretary of Defense Donald Rumsfeld faced their legislative overseer, the Senate Armed Services Committee. An invasion of Iraq seemed imminent. Tensions with North Korea were mounting. Senator Warner asked Myers the obvious question: Was the military prepared? "So, I start with you, General," Warner said. "The armed forces, which are under your super-vision: Is it your professional judgment that they are prepared to meet any contingency for the use of force as may be required in Iraq . . . and to continue the high level of activity against the worldwide terrorism?" General Eric K. Shinseki, then Army chief of staff, wrote to Congress a few weeks later, saying that the administration budget left the Army alone $3.2 billion short of what the service needed for "sustainment of war-fighting readiness." Shinseki's wish list of unfunded requests included items as basic as guns, bullets and armor. "We are executing the missions that have been given to us, and the requirements have continued to escalate," Lieutenanat General Joseph Yakovac Jr., of the Army Acquisition Corps, responded. Hunter, the committee chair, asked Brigadier General William Catto of the Marine Corps Systems Command the same question. "When you're in a war fight and you've got these IEDs blowing up, and we're taking fairly substantial casualties, why would force protection, such as up-armor, ever be an unfunded requirement?" Hunter wanted to know. "We've got military construction programs for things like gymnasiums, and yet that money continues to flow into those programs, which are peripheral to the war fight, and it doesn't go to the fight. That seems, to me, to be a major defect in this system. Would you agree with that?" In March 2004, Brian held a news conference with Representative Martin T. Meehan (D-Mass.) to insist that the Army spend all funds already set aside for vehicular armor immediately, rather than over months.